It also supports UCS2 encoding data and text data format directly which makes your robot could do TTS voice broadcast at any time. It supports DTMF, once the DTMF feature was enabled, press the keys during a call can be converted into character, and can be used for remote control. 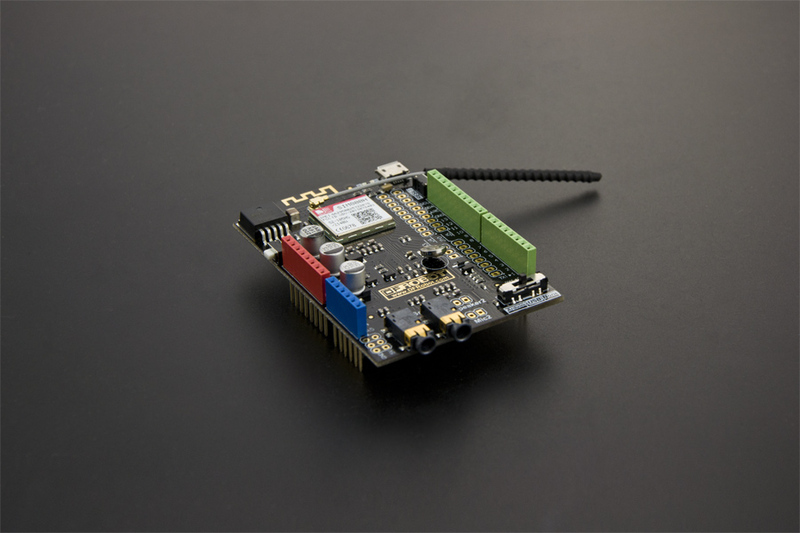 It is controlled by AT commands, you can launch its functions directly through computer serial port or Arduino board. The module was embedded with SIMCom's SIM800H chip with good stability. More updated feature could be refered to the description of the SIM800H chip. Meanwhile we also show some application of the SIM800H library, it can help you to get familiar with this shield in a easier way. This shield is compatible with Arduino board like Arduino UNO, Arduino Mega1280 and Arduino Mega2560 (5V standard operating voltage). Press the button for 2 seconds to boot/shut down module. Note: This button is connected to digital Pin 12, so you can also boot/shut down module by setting the Pin12 value. 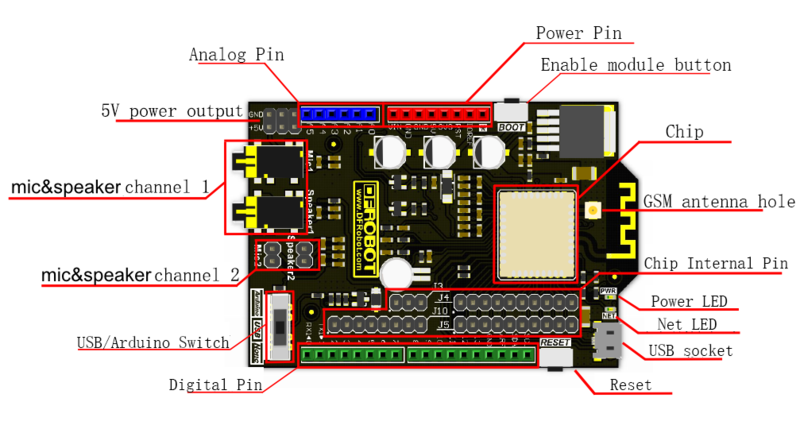 None: Push to this side when uploading sketch to Arduino board like Uno, Mega except the leonardo. Arduino: communicate with Arduino through the sketch. USB: communication with PC through the serial(USB cable). These socket and pin are used to play TTS and dialing. Note: You could change the TTS output channel with AT command. Default channel is channel 1. NOTE: Note: It needs external power supply (6-12V) for the higher power consumption as the GSM mode. How to enter into AT mode ? Connect UNO power jack with an external power supply, 6-12V @ >500mA. Set the swith to USB. 2 Boot SIM800H in two ways, anyone of them will work. Choosing the right board and Serial port at Arduino IDE menu bar. Open the serial monitor or other Serial Assistant software. Choose "Both NL & CR". Wait for the NET led to blink as finding net, then you could send some AT commands. Otherwise please check the external power supply/ SIM card/ switch position, and then RESET the module. Return: OK Description:AT test command, to check if you could enter AT mode. Return: OK Description: Set SMS form as text mode, when you want to receive SMS via AT commands, you need to send 'AT+CMGF=1' firstly before sending 'AT+CMGR=1'. Return: > Description:The UCS2-BIG codes inside the quotATion marks is the target phone number to send SMS. when you get ">" characters, enter the message you want to send, content encoding is UCS2 encoding (Set before), then tick the HEX to send, and send "0x1a" expressed as CTRL+Z (0x1A) to send SMS. Return: OK Description: Delete SMS of number 1 in memory. Extract the hardware.zip If your Arduino IDE is below 1.5.5 version, cut HardwareSerial.cpp to Arduino\hardware\arduino\cores\arduino and cover the original file. If it is version 1.5.5 or later, then cut the HardwareSerial.h to Arduino\hardware\arduino\cores\arduino and cover the original file. NOTE: Not compatible with Arduino IDE1.6. *, Recommand Arduino IDE 1.0.6. Don't forget to turn the switch to "Arduino". The sketches showing in the chapter are included in the library. Open the sketch "Examples\sim800program\MakeVoiceCall" in Arduino IDE. Function description: SIM800H module is initialized, and then dial the number 15982373181. 1. Sim800Cmd sim800demo(fundebug); This function is to recognize incoming call, if there is an incoming call, it will call the fundebug(void) in the end. You could write something to deal with the incoming call: answer or not. But do remember that do not write too much lines in the sub-function. 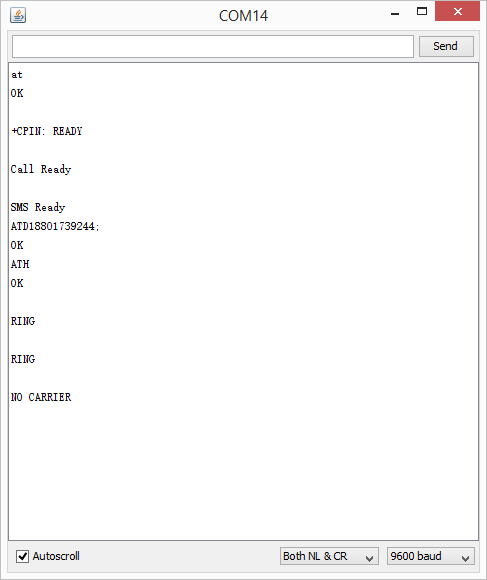 2. sim800demo.dialTelephoneNumber("15982373181;"); This function is making a dailing. Do not forget the format ";" behind the dail number. 3. sim800demo.sim800init(); This function is to finish the initial module, it's much more easier than the last version product. Open the sketch "Examples\sim800program\SendSMS " in Arduino IDE. After initialization success ,enable prompt SMS. **Function description：**Enables SMS notification, send a text message. 2. sim800demo.sendSMS("00310035003900380032003300370033003100380031","4F60597DFF0C6B228FCE4F7F752800530049004D0038003000300048"); This is to send a text message, the first parameter is a phone number, the second parameter is the content to be sent, both of these parameters is UCS2 encoding. the text message cannot be longer than 20 characters, or saying 80 UCS2 encoding. 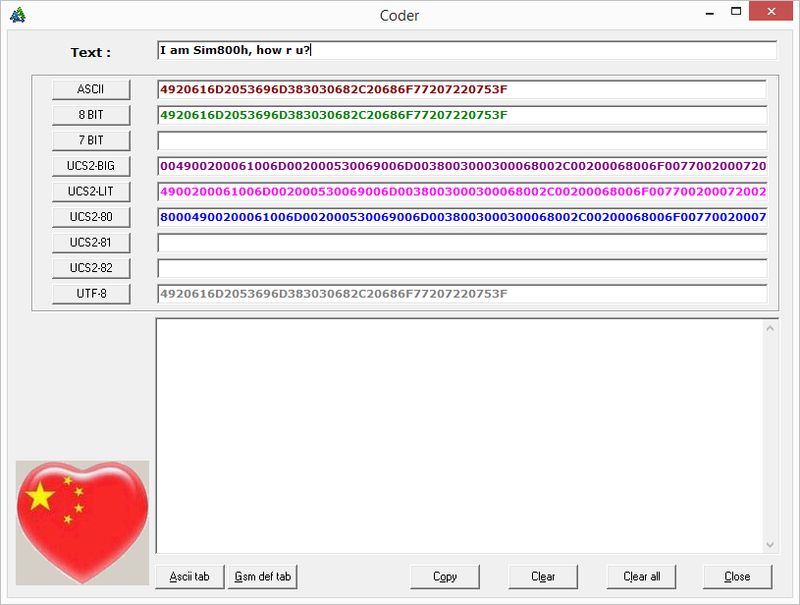 here need to convert string to UCS2 encoding, you can download the softeware "CharCoder"to transform the string to UCS2 encoding, ps: UCS2-BIG. Open the sketch "Examples\sim800program\sim800test " in Arduino IDE. Initialize the SIM800H module, enable SMS notification, enable DTMF feature. If there is an incoming call, answer it and reset rqt to 1, voice broadcast, if there is any DTMF input, then assign it to rqt and then judge rqt for appropriate action. sim800close (): power down the SIM800H. getTTSState (): Gets the current broadcast status, if it is broadcasting, then return 1, otherwise return 0.
getDTMFresult (char *PCH): get the DTMF data. deleteSMS (char *PADR): delete SMS, the parameter *PADR is the message number you want to delete. Get it from SIM800H GPRS Shield V1.0 Communication Module or DFRobot Distributor.